Did you ever have a scan of a printed page that you needed to edit? You probably had someone read it to you word-by-word as you typed. Or if no one was around, you read a few words and typed a few words, over and over, until your neck was sore or you were done. OCR (optical character recognition) is when you let the computer do that for you. It’s much faster, and once you do it, you can search content, make edits, etc. If you have PhantomPDF 7.3 or later and want to use OCR, you need to install the Foxit OCR Add-ons. Why is OCR an add-on? Many people don’t use OCR, the Download is fairly large, and most people are in a rush to get going with PhantomPDF. So to reduce the size of Foxit PhantomPDF, we make the OCR feature a separate—but free—download. You must have the OCR Public file installed before you can install a language pack. Select the red “Foxit PhantomPDF” tab, then scroll down to the bottom of the page. Select the OCR Public Add-on download first, then install it. Select the OCR Language Add-on download next, then install it. That’s it. Now PhantomPDF is ready to do OCR on your PDFs! You can perform OCR on the current file you have open or on multiple files. Choose a single language or multiple languages for your output. Even use the Quick OCR tool under the HOME/CONVERT tab to use the OCR settings you used previously, with just one click. For details, check “Chapter 4 – Create” in the Foxit PhantomPDF User Guide. I added the newest OCR add-ons to my Foxit Phantom version 2.2.4.0225 and it still tells me I have to download it when I click Tools OCR. I do not have a “home” tab or a “convert” button anywhere on it. Can you advise? 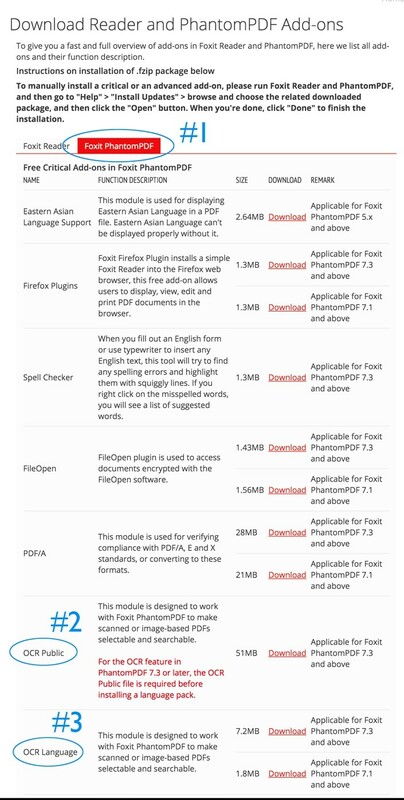 Please go to “Help” tab in Foxit PhantomPDF, click on “Install updates” to install the newly downloaded .fzip format file. Finally, please try to OCR PDF file again and let us know the result. I have installed the OCR addons according to these instructions twice, and restarted Phantom each time. There is no option under Home or Convert for OCR. Hi Joe, Do you mind to send an email to support@foxitsoftware.com so they can walk you thru. I need the OCR Polish language add. How to install it? Help > Install Update inside the PhantomPDF and find the downloaded .fzip file and click Open button. I downloaded OCR Public and OCR Language adds for Arabic language and I don’t how to install them, there is no video in tutorials explain the way to install them, therefore would like please tell me how to install them ASAP.